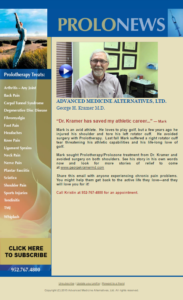 ProloNews Newsletter – April 2016 | George Kramer, M.D. Tracy was suffering from severe pain leg pain eminating from a large herniated disc. She tried cortisone, but nothing really worked for very long. She even tried accupuncture. She had dramatic improvements after the first Prolozone injection.